How many people here are not from the south? I say hello to all of you present. And to those of you not from the South, I want to give a special welcome to the South, and say a little more about this region where we are meeting as a context for my comments about building cooperation for workplace democracy. The south contrasts deeply from the east. We are gathered here in the poorest region of the country, with the highest percentage of people without health insurance. Racism is prevalent in all regions of this country but here in the South there is a particular continued legacy of racism from slavery, and the violence that was necessary to keep such a brutal system in place. There are decades and decades of extracting the area's resources of coal, timber and minerals by companies owned outside the region while exploiting workers of all races, a history which continues today with mountaintop removal. Of the bottom ten states in education expenditure per child, six are in the South, and those are the same states absorbing the highest percentage of children from families displaced by Katrina. The south has the highest percentages of people who don't complete high school, so we aren't surprised then that the region with 25% of the nation's population provides over 40% of the soldiers in the U.S. military, and thus we are over-represented in the young men and women dying in Iraq and Afghanistan. The south is changing dramatically from immigration, with the last census showing Latino population increases in southern states at 200 to 400%. On top of the influx of people seeking jobs and economic opportunities, jobs here that once left the North and moved south have now left the U.S. South for the Global South, or far east, leaving communities without jobs, creating tensions between working class people here and immigrants, and exploiting workers across the globe. In many rural areas of the South, the only growth industries are prisons, and incarceration rates in the South are the highest in the country. Well, you might say, where's the good news about the context for building cooperation and workplace democracy, especially in the South? Despite all of that or because of it, the South has a rich heritage of struggle, solidarity, culture, courage and success against the odds. Those of us who stay here to do our work do so out of a sense of culture, history and a sense of place. We know that the civil rights movement moved the whole country forward and that the region that birthed the civil rights movement is still giving us great models of organizing and cultural sustainability in African American, Appalachian and rural communities. So I welcome you to the South where we say that the worst thing is the overt racism, sexism and homophobia and the best thing is the overt racism, sexism and homophobia. What you are up against is always clear. I bring you greetings from the Highlander Center where we support grassroots organizing by supporting people to take collective action in their local communities. Our "classroom" at Highlander is round and people sit in a circle in rocking chairs and learn from each other as they share stories of action, strength, fear, mistakes, great ideas, strategy and analysis and then go home inspired to do things they never thought possible. I want to acknowledge the many shoulders on which I stand as Highlander's current director, going back to the founder Myles Horton, and those who co-founded Highlander Folk School with him, and all those hands and hearts over the years who are part of Highlander's continued work for justice, including Frank Adams here tonight. And I must also mention among those historical shoulders, Zilphia Horton, Myles' wife, who was the person in Highlander's earliest history who understood the power and necessity of integrating music, culture and art to Highlander's education and organizing work, themes which continue in our work today. At Highlander we have our own version of a non-profit democratic workplace. Our staff ranges in age from 28-73. We are Black, white and Latino. We are gay/lesbian and straight. We are Christian, Jew, Muslim, Buddhist, atheist and agnostic. We are Appalachian born and raised, and people who have moved there from Chicago, Mexico, and other places. We have an organizational structure with a director, and also democratic participation in the praxis of our decision-making, and let me tell you - democracy is messy. Our society is anchored in racism, sexism, and an economic system that sets up a certain percentage of us to be losers and then blames them for losing. And when you are trying to figure out equal say and equal participation in that, it is quite complicated but it is also very powerful, and figuring it out takes us to many rich and fertile places toward the kind of society we want to live in. This year is Highlander's 75th anniversary, and in our reflections on that, and preparations to celebrate this Labor Day weekend, I am conscious of history and its role in where we are today and where we go from here. And in that I want to congratulate The Federation of Southern Cooperatives/Land Assistance Fund on their 40th anniversary. John Zippert (director of the Federation of Southern Cooperatives) Highlander is proud to have collaborated with you over the years and congratulates you. I am excited about worker-owned collectives because they automatically challenge the capitalist infrastructure. I grew up on a small farm in rural Kentucky where I learned that economic survival was not each "man for himself" but family and neighbor helping each other out. When it was time to set tobacco, we set my grandfather's tobacco, then my Uncle Coleman and Aunt Aggie's, then ours, then our neighbor Earl Puckett's or Joe Brown's, and nobody stopped until everyone had their crop in the ground, and when it was time to cut tobacco, and then later strip tobacco, we all did the same thing of helping each other out because economic survival depended on it. When you think about building democratic workplaces and worker-owned collectives in the South, these are the values that still reside in southern hearts, values that need to be tapped and people helped to remember that this is what we come from - because we've had a strong 20-plus intentional years of people being pitted against each other through the divide and conquer strategies of the right wing and we are all suffering from it. And what does the divide and conquer strategies of the right wing have to do with workplace democracy and worker-owned collectives? Because when right wing strategies pit people against each other, they play to people's fears rather than to communal hopes and visions; because they ingrain in us that there is not enough and if someone gets something it takes it from someone else, instead of helping people see that there really is plenty to go around, and this is a competitive, power-over value and not a cooperative value; because they take people's real economic fears and convince them it has to do with gay people or immigrants or welfare recipients or people of color instead of the devastating corporate greed inherent to U.S. capitalism. And, because right wing strategies and accomplishments have framed the sky under which we all have lived for nearly 30 years. 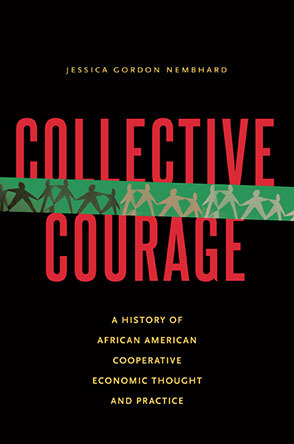 If "a cooperative is a group of people who have joined together to control their own destiny," how do you build that in a society where democracy has lost ground since 1980? The majority of people are against the war, but we're still in it. Global forces shape life in local communities in ever-increasing ways. The efforts to successfully build worker-owned collectives with the ability to grow has to happen on two levels. One, of course, is the actual organizing them, which you all are doing. The other, I believe, is shifting the societal values, community norms and public policy that hinder collective efforts, and changing the public space in which these models can more effectively thrive and spread. And the only way I know how to do that is basic organizing. I was at a national gathering recently of leaders from across the country working on rural issues, and in the section to prioritize strategy for action steps, people said we need to do this, we need to do that, and they were right about those things, but those things are not going to be accomplished-- we aren't going to be able to do any of that --if we don't change the power structures in our local communities, if we don't make tremendous shifts in the policies of government and local, state and national leadership, and the only way I know how to do that, again, is organize. "Southern whites of my generation who got involved with the civil rights movement turned our lives around. What we did is what this whole country needs to do: turn itself inside-out and upside-down and build a society not built on racism. You have to come to terms with this; that the society you live in is totally wrong and that it is destroying you as well as people of color." And later in an article for Southern Exposure, Anne wrote, "White American will not change its militaristic foreign policy until it transforms its thinking and its actions toward people of color, and ... this process must begin at home. In a sense, white America as a whole today stands in a position similar to that of the white south when I grew up in it - in order to save itself, it must go through that transformation process and recognize that it can and must work cooperatively with the world's people of color, instead of assuming the right to dominate. We who are white southerners have reason to know that this transformation process is painful, but it is not destructive; in fact, it is the road to liberation." And this isn't history. It's a need now. Hurricane Katrina blew the lid off structural racism, poverty, environmental degradation, and failing infrastructures so blatant along the Gulf coast but true in all our communities. Across every television news cast, people could clearly see as if written on the ticker going across the bottom of the screen: if you are Black, if you are poor, the government does not care. Did we know it already? Yes. Did we learn it anew and for the first time during Katrina? Yes. And that is a challenge to democratic workplaces and worker collectives: how to build multi-racial collectives within a society that was founded and sustained by white privilege, white supremacy and racism, and that has for centuries built itself on justifying the difference between the haves and the have nots. "...Some clothing workers had organized and asked for recognition. The company refused and they went out on strike. They asked us to come down from Monteagle to help keep the strike going. It was decided to have a Washington birthday parade since the workers felt they were striking for freedom - economic freedom. There was a minister in the parade. Children and strikers. We were marching two by two behind the band and when we marched by the mill, they opened up on us with a machinegun. Several people were hit. Highlander's librarian, [Hilda Hubert], was hit in the ankle. I looked around and the police had disappeared. There had been quite a few of them, too. One of them was lying in a ditch. I said to him, "What are you doing there?" He said, "Lady, I've got a wife and three kids." In about five minutes after the firing stopped, a few of us stood up at the mill and started singing. And in about ten minutes, people began to come out from behind the barns and little stores around there, and we stood together and kept singing, â? ?We Shall Not Be Moved.' That's what won them union recognition." We don't know all the names of those people who came out from behind the barns and little stores after just being shot at by a machine gun, but we do know that some of these everyday folks didn't hide in a ditch, they stood up and they sang. I was wowed by John Lewis' autobiography Walking With The Wind. Now, like many of you, I have done a great deal of picket lines, protests, marches, vigils and gone to jail for nonviolent civil disobedience, but I have never stood at the end of a bridge, like those young African Americans in the Student Nonviolent Coordinating Committee, looking the power of the state right in the eye on the other end of that bridge holding a billy club and fully intending to whack you over the head with it, and you standing there with a choice--keep walking or turn around. I have never faced that, but John Lewis and other civil rights marchers did. And they kept walking. They crossed that bridge. John Lewis wasn't Congressman John Lewis then but he was that young kid from rural Alabama who stood up. Closer to home and some years later, over near Erwin, Tennessee, Hobart Story was upset about a dump in a little community called Bumpass Cove. On his own he started monitoring the trucks going into this particular holler and talking about the dump to his friends and neighbors. It took Hobart Story two years to get other people interested and involved in this issue, but they finally did. Highlander helped community members learn how to research public records to find out what was going in that dump and strengthened with that knowledge and information, the community came together and got that toxic dump closed. Currently we see the remarkable courage in the rallies and marches all over the country for fair and just immigration - everyday folks in a harsh set of circumstance resulting from the effects of global capital and U.S. foreign policy. The people marching are working families, people with their kids, and youth. They are janitors and nannies, poultry workers and construction workers, and teachers to name a few. They are like the two women in our Pueblos de Latinoamerica program from Louisville, Kentucky who said, "I'm done with crying. I'm ready to do something." All of these stories have a similar theme that is crucial - making a choice. After you've been shot at by machine guns, do you stand up and sing or hide in a ditch? When you know that dump is full of poison and no one listens to you, do you stop talking or keep working? When you're facing police with billy clubs, do you cross the bridge or turn around? And this kind of courage is needed in these times again now. I like to close my talks not with my words but yours, and usually encourage people to turn to a neighbor, and talk to each other. So during the weekend I ask you to talk with each other about current models that you are doing or seeing that bring forth the courage to resist, that say "no" to the ways things are and "yes" to the ways they can be.